Although I am okay with rationalising bridging halides and $\mu$-2 CO I can't seem to figure out others, including $\mu$-2 hydride, CN- and NO. -Neutral bridging ligands contribute to the overall complex the number of electrons they would have when terminally bonded. These electrons are given in any proportion. This means that $\mu$-2 bridging CO gives 1 electron to a metal centre, for example. -Ionic counting gives even numbers of electrons for ligands; I am unsure if this is still the case for bridging ligands - I suspect not? Considering NO, I would therefore believe it to be a 2 electron donor to one metal and a 1 electron donor to the second metal. Considering hydride, more specifically the dimer form of titanocene, I have been taught that each Ti centre is 16 electrons. I have been told, separately, that each hydride contributes half an electron in neutral counting, and 1 electron in ionic. 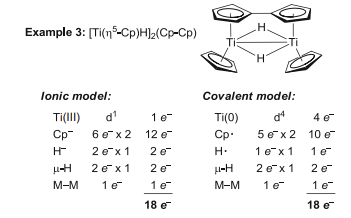 This would lead to a 16 electron complex for "Titanocene" if there is a Ti-Ti bond, however this source: https://link.springer.com/content/pdf/10.1007%2Fs40828-015-0010-4.pdf seems to imply that it is in fact an 18 electron complex, with each individual hydride contributing more than its total electron count? Is this source correct (and my lecturer wrong) in how you would count this complex? Considering CN-, this is similar to hydride I believe, and should be treated in the same way - is this correct? Cyano-ligands are isoelectronic to carbonyl ligands, so I'll leave that to you as an exercise to figure out. Not the answer you're looking for? Browse other questions tagged inorganic-chemistry organometallic-compounds or ask your own question. Why do ionic compounds dissociate whereas coordinate complexes won't? Would trans hydride ligands on a metal complex be beneficial for a catalyst? Why does Fe(CO)₄ adopt a tetrahedral, as opposed to square planar, geometry? Iron (II) dioxygen reaction mechanism? Why is the iron(II) on the heme molecule depicted as having 6 electrons in its 5 d non- and anti-bonding orbitals? What is the reason of the color difference for the cis/trans isomers of tetraamminedichloridocobalt(III) chloride?